Worried you’ll miss out on your dinner rolls this holiday season? Fear not, friend! 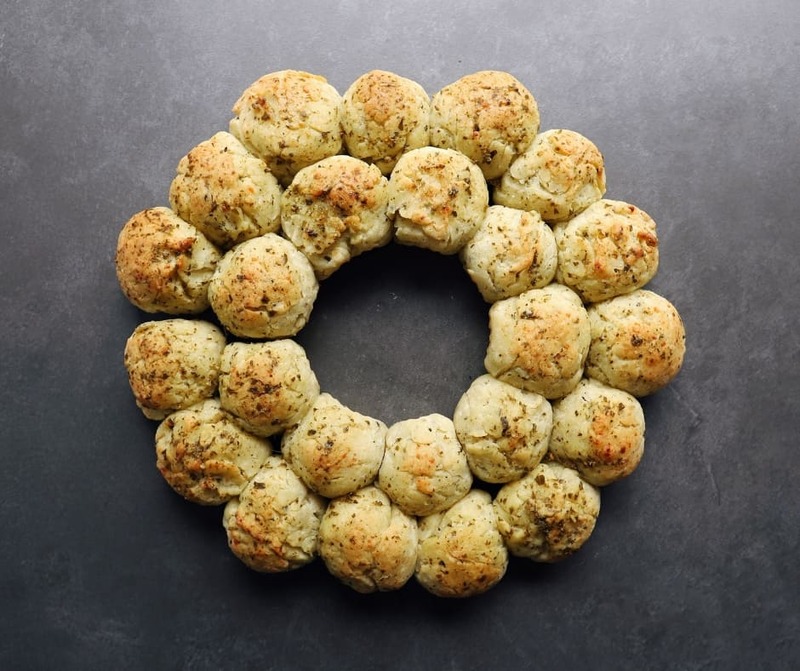 This adorable low FODMAP pull-apart bread wreath is just what you need. These light and fluffy gluten-free rolls will be the highlight of your holiday table. And they’re pretty tasty to boot! While I’m a huge fan of dinner rolls, this bread wreath was my first experience with pull-apart bread. I have to say I’m a pretty big fan! Aside from all the fun designs you can make (tree? snowman? star? ), I find baking the rolls so close together keeps them extra moist. A word of warning, though. Be careful not to over-mix the dough. Because our rolls are gluten-free, they can get a little tough if you overwork them. Just make sure your ingredients are mixed together and let the xanthan gum do the rest. 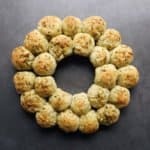 Think this low FODMAP pull-apart bread wreath sounds great, but you don’t have time to try it now? Don’t worry, you can PIN THIS POST for later! You don’t need to miss out on your Christmas rolls with this easy low FODMAP pull-apart bread wreath. Check out the notes below for tips on keeping this recipe FODMAP-friendly. First, if you’re in the elimination phase of the diet, you’ll need to use gluten-free flour (preferably one without gums since we’re adding our own). This recipe also uses xanthan gum. Even though xanthan gum isn’t a FODMAP, it can cause problems for people with IBS. If you’re not sure how you react to gums, try one roll and see how you react. If you want to learn more about xanthan gum, check out this article by Chris Kresser. Next up is milk. 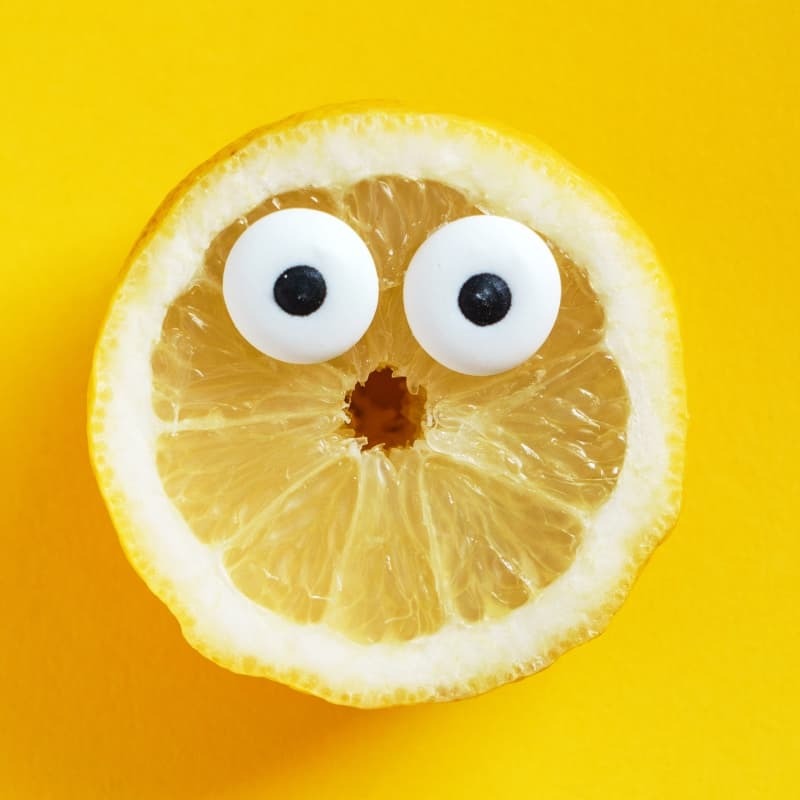 If you’re in the elimination phase of the program, you’ll need to use lactose-free products with the exception of butter. According to the Monash app, butter doesn’t have any FODMAPs (because it’s all fat). Just make sure the brand you use doesn’t have any “milk solids” listed in the ingredients and you’re good to go. We’ll also be using parmesan cheese. According to the Monash App, parmesan is safe in servings of 1/3 of a cup per sitting. Servings of 4 cups or more are high in lactose. This recipe uses 2 cups of parmesan for 24 rolls. This works out to 1.3 tbsp of parmesan per roll, which is well within Monash’s recommended range. Last but not least, pesto. Most commercial pestos are packed with garlic. That won’t do for our FODMAP-friendly holiday bread wreath, so you’ll likely need to make your own. Here’s my quick and easy low FODMAP pesto recipe if you need one. 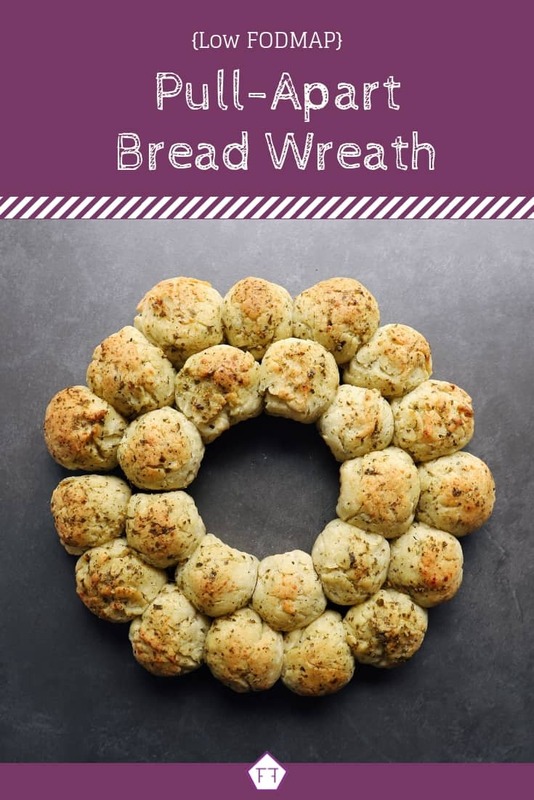 Want to try this low FODMAP pull-apart bread wreath? Don’t forget to PIN THIS RECIPE for later! Need some FODMAP-friendly rolls for your holiday bash? This low FODMAP pull-apart bread wreath will be the highlight of your table! Combine your flour, xanthan gum, sugar, yeast, and salt in a large bowl. Whisk to combine. Melt your butter in a small saucepan over medium-high heat. Remove your pan from the heat and add the milk. Let it stand for about 1 minute so the milk is warm. Then pour the milk mixture, egg, parmesan, and 4 tbsp of pesto into the flour mixture. Give it a gentle stir with a wooden spoon until it begins to form a dough. Turn your dough out onto a lightly floured surface and knead it 8-10 times. You can sprinkle on a tiny bit more flour if the dough is really sticky. You want it to feel tacky to the touch, but not stick to the counter. Transfer the dough to a large greased bowl and cover with plastic wrap. Let the dough rise in a warm place for 1 hour. The dough should double in size. I used a 16" pizza tray to make the wreath shown. Whatever kind of tray you use, make sure to line it with parchment paper. Section your dough into 24 evenly sized pieces, then work each piece into a small ball. To make this wreath, stick a ramekin or a wide-rimmed mug in the center of the tray and arrange your dough balls around it. Then remove the ramekin, cover the dough with plastic wrap and let it rise in a warm place for 1 hour. The dough should double in size again. Preheat your oven to 375 degrees. Bake your rolls for 18-20 minutes (until they look golden brown). Brush the rolls with the remaining pesto and let them cool down for at least 10 minutes before serving. You won’t need to skip the dinner rolls this holiday season with this tasty low FODMAP pull-apart bread wreath! If you like this recipe, don’t forget to share it! Together we’ll get the Low FODMAP Diet down to a science! 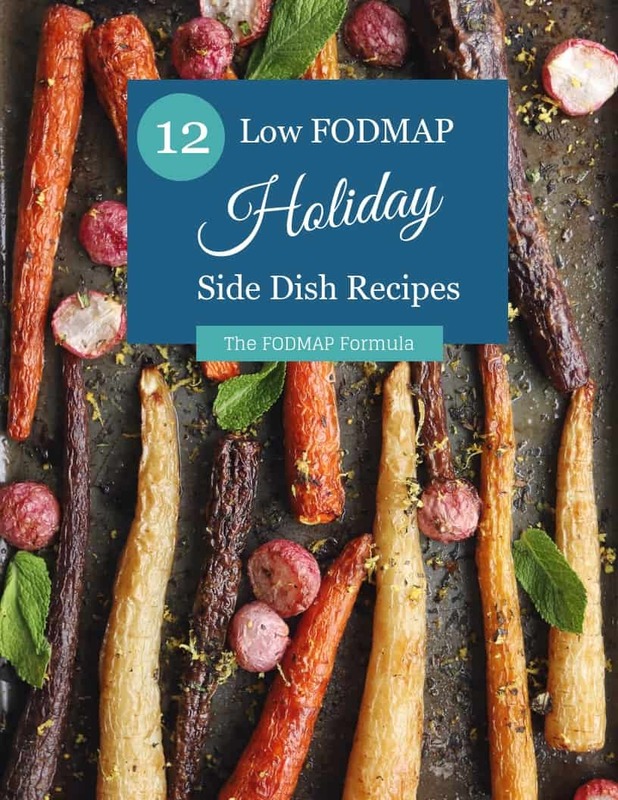 How to Plan A Low FODMAP Holiday Dinner Managing the elimination phase can be a challenge over the holidays! Check out this article for everything you need to know about managing all the moving parts of your next holiday meal. Low FODMAP Rosemary Potatoes Looking for an easy side dish recipe? Made with a handful of ingredients, these rosemary potatoes are the simple side dish you’ve been craving.